We have a team of swimming pool builders who can create a backyard oasis where your family and friends can gather and relax on a hot day in Mooresville, NC. Swimming Pool Builders in Mooresville – With average temperatures in the high 70s and 80s in Mooresville, North Carolina during the summer months, it can get very warm for residents and visitors alike. 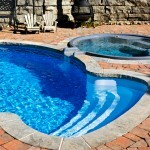 At Lake Norman Signature Pools & Patios, we are a team of swimming pool builders who can create your custom swimming pool, adding a backyard oasis where your family and friends can gather and relax on a hot day. Our swimming pool builders understand your exacting standards and will ensure we not only meet your expectations, but exceed them. We create resort-style swimming pools and spas that can be either a place of serenity or a place to play with the children. We offer on-site consultations to personalize your plans to your space, whether you are adding to an existing home or performing new construction. If you are looking for experienced and skilled swimming pool builder in Mooresville area, Lake Norman Signature Pools and Patios can transform your dream pool into a reality. At Lake Norman Signature Pools & Patios, our swimming pool builders proudly serve Mooresville, Cornelius, Davidson, Denver, Huntersville, and Lake Norman, North Carolina.